your coursework when everything is still fresh in your mind. 2. The National-Interstate Council of State Boards of Cosmetology (NIC) provides tests to more than 30 states. Go to www.nictesting.org to see if your state is one of them. If it is, click on www.nictesting.org/testing-program/ to see sample questions and a link to paidpractice exams, which will give you an ideaof what types of questions will be asked. Find the Candidate Information Bulletins(CIB) on the NIC website to learn how test questions are weighted. Download andprint the practical CIB for nail techs and study it. 3. Check out www.milady.com (click on the Product Catalog tab and then Online Licensing Preparation) to find resources for study guides. Many state tests use these as the references for test questions. board’s regulations. California usually leads the pack in terms of state board regulations. Whether you’re in California or not, you might consider checking out www.californiastateboard.com for information on exam prep tutoring. 5. Check and recheck your kit and materials against your state regulations, and bring duplicates of items in case of a mishap. Label all of your materials accordingly. it on your practice hand. Do the same with nail tip application, acrylic nail enhancement application, and the blood exposure procedure. before your test. Time yourself and get familiar with your kit. 8. When in doubt, sanitize. This is first and foremost a test for consumer safety. Sanitize every step of the way. It is the number-one thing proctors are looking for. 9. Leave plenty of time before the test begins to park, use the restroom, and walk to the testing room. Bring money for a parking meter. Consider visiting the testing site a few days before so you know exactly where it is. 10. 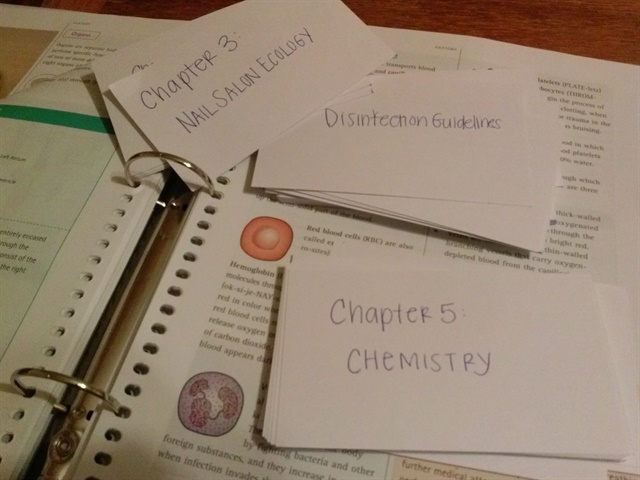 Put all the vocab words (like nail diseases) and subjects you have problems with on flashcards. Run through them regularly until you’ve mastered them.